Download and try Easy Shutdown Software Utility for free. 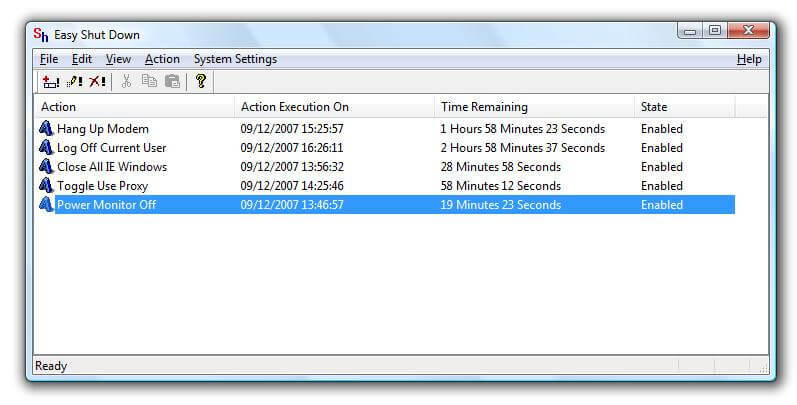 This Auto Shutdown Software works fine on Windows Computers running any version later than Windows XP upto Windows 8.1 (also called Windows Blue). You must have appropriate Access Rights to Shutdown a Windows Computer in order for this Auto Shutdown Software to work. You can Register your copy of Easy Shutdown Software Utility by paying in $5.00 only with Credit / Debit card or with a Paypal account. The Registration Link is provided in the Menu of the Software as the Screenshot to the Right displays. Do download the Free Trial Version from the Link above and Pay the Registration Fee only when you are fully satisfied by the features provided by this Auto Shutdown Software. Provides easy way to add actions to be performed Daily/Weekly. 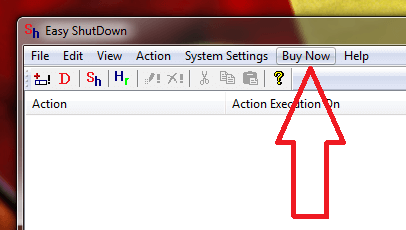 Action Can be used to Auto Shutdown,Switch off,Power Off,ShutDown,Restart, and Hibernate Computer. Action Can be used to Log Off Signed On User,Power Monitor Off,Close All Internet Explorer Windows. Action Can be used to Hangup Modem,Stand By Computer. Provides a way to launch various useful Control Panel Items in Vista Operating System. Provides a way to Power Monitor Off. Provides easy way to ShutDown Computer Daily/Weekly. Can be used to auto shutdown computer at specified time. Can be used as shutdown timer to shutdown computer after defined duration. Provides easy way to Hibernate and Wake Up / Resume Computer. Create Shortcut with or without action confirmation dialog (for action initiated by the shortcut). Easy ShutDown Software Utility provides easy way to create Desktop Shortcut to ShutDown, Restart, Toggle Use Proxy, Hibernate Computer. Create Desktop Shortcut to Log Off Signed On User, Power Monitor Off, Close All Internet Explorer Windows, Hibernate Computer and then WakeUp/Resume Computer. Desktop Shortcut to Hangup Modem, Stand By Computer. Create System Wide Hot Key to ShutDown,Restart,Toggle Use Proxy,Hibernate Computer. Get System Wide Hot Key to Log Off Signed On User,Power Monitor Off,Close All Internet Explorer Windows. The Software Utility provides easy way to create System Wide Hot Key to Hangup Modem,Stand By Computer. Create Hot Key for Shutdown Computer, Restart Computer, Hibernate Computer and much more. Free to try Software by EasyShutDown.com. Easy ShutDown provides various Other Useful Features. 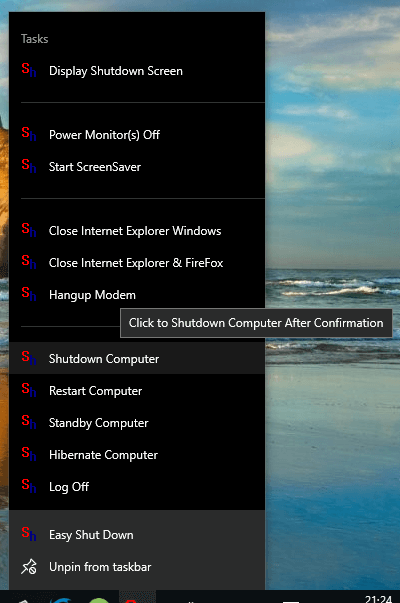 EasyShutdown works on Windows 10, Windows 8.1, Windows 8 and even on Windows 7 as and does provide a rich JumpList to invoke various features of the Shutdown Software Utility. A Picture is worth a thousand of words. Do have a Look at the Page of Easy ShutDown , which provides other screenshots of the software. Auto Shutdown computer using Easy Shutdown. Read about Upcoming Features in Easy ShutDown Utility here. Download Utility : Download Utility : Download Free / Free to try Windows Utilities.